A much better week for us this week, with a big result in the AFL Grand Final plus some positive variance in the NFL. The highlight of the week was definitely the AFL Grand Final on Saturday. I mentioned last week that the promos for both Grand Finals would be great but, with only one game each, there was no guarantees of any of the hitting. Well, the AFL hit in style. Early on in the game it looked like the Magpies were going to dominate. They sprinted put of the gate to build up a 31-2 lead, but that was slowly clawed back by the Eagles over the remainder of the game. The final score was 79-74 in favour of the Eagles. Due to the narrow margin we received a $172 double payout from Pointsbet (‘Get Paid as a winner if your team lose by 9 or less’). We also received a $50 cash refund from Ubet (‘Cash back if your team lead by 15 but lose’), and a $50 bonus bet from Sportsbet (‘Double profit if your teams wins’). 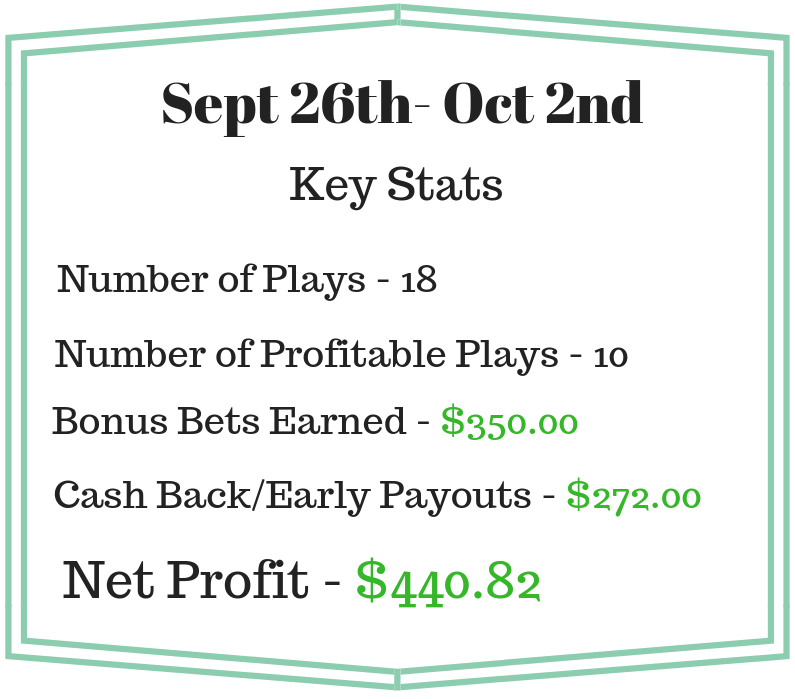 Overall, our net profit on the AFL Grand Final was $224.50. The NRL final wasn’t quite as satisfying, but we still walked away with $10 profit. We’ve been making a lot of +EV plays on NFL over the last few weeks without any great returns. That all changed this week though and we saw the profits that we knew would eventually come. Throw in the excellent Spring Carnival racing promos and it has been a very good week indeed!